By now, just about everyone in and around Autzen Stadium knows the name Hunter Kampmoyer (3-Star/Bishop, CA). But what was behind the almost instantaneous pledge to become a Duck? Kampmoyer, it appears, has had his eyes trained on Oregon since his decommitment from Arizona State earlier this year. “I told my parents last week if Oregon offers, I’m done. So they knew when I got the offer I would be committing,” said Kampmoyer. The 6’4, 240 lb. two-way force is eager to find his niche in Eugene and could easily appear on the two-deep at multiple posts. 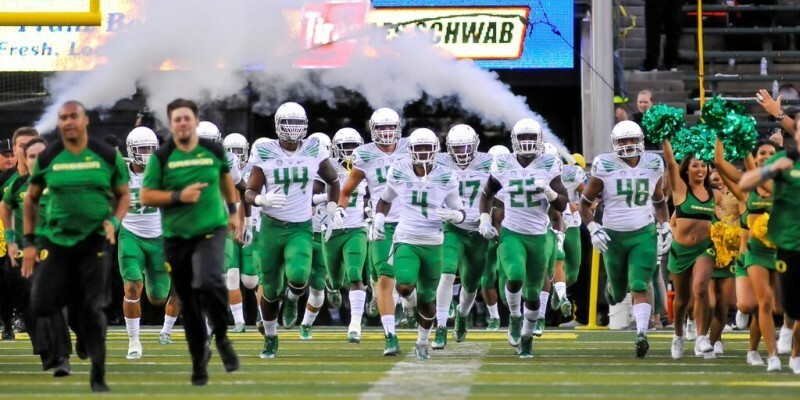 The Ducks now boast eight commits in the 2016 class; a list can be found here. It’s never seemed to be an issue generating interest from top preps in regard to a possible tenure at Oregon. However, making a connection that supersedes style of play — and maybe more importantly distance — has been another story. One of, if not the highest-touted point guard in the class of 2015, Jamal Murray (5-Star/Kitchener, ON/Rivals150) broke a frustrating mold over the weekend and journeyed to Oregon by way of Canada. Beyond a tweet that Murray posted late-afternoon on Sunday, not much information has trickled out of his camp. Coming by way of 24/7Sports’ Matt Prehm, Oregon fans have reason to get on “Murray-Watch” as the 6’5, 180 lb. slasher is said to have had many conversations with the Oregon brass that foretold a matter of when he will join Oregon, not a matter of if. Murray’s family joined him on his excursion in and around Eugene and were said to have been very impressed with Oregon’s approach to athletics and the support that is given to student-athletes both on and off the court. Murray’s commitment may already be made in his mind; we, the Oregon Faithful, will now just play the waiting game, WTD!! !